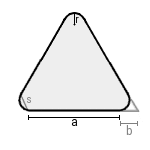 Calculations at a rounded regular polygon or regular n-gon, like e.g. a rounded square, pentagon, hexagon or octagon. Enter the number of rounded corners, the straight edge length and the radius of the circle which forms the corners. Choose the number of decimal places, then click Calculate. Lengths, radius, and perimeter have the same unit (e.g. meter), the area has this unit squared (e.g. square meter).